This game, along with many others this past season, was definitely one to remember. Many things happened at this game, including the Grayson Allen trip that immediately started trending, some of Harry Giles first college points, and a big win over Elon (also a celebratory dinner at Waffle House afterward). Despite the tripping incident, this game was very enjoyable. It was right before Christmas time, everyone seemed to be feeling the joy that Christmas brings. Although it was a home game for Elon, the coliseum was flooded with Duke fans. Including me, repping one of my favorite past players, Kyrie Irving's, jersey (pictured above). Luke Kennard was on fire, per usual, scoring 21 of the 72 points. While we thought it was going to keep heating up, things got serious with 4 minutes left in the first half. Grayson Allen was whistled for getting tangled up with Elon's player, Santa Anna. We all saw it happen (Troy and I experienced it front row) and immediately thought "oh no, not again". The look on Grayson's face was one of disappointment. You could tell he instantly knew it was a big mistake, and I personally do not think it was intentional. Of course it was a big deal in the sports world. For the next few days, even months, it was the main topic for a lot of sports sites/media. 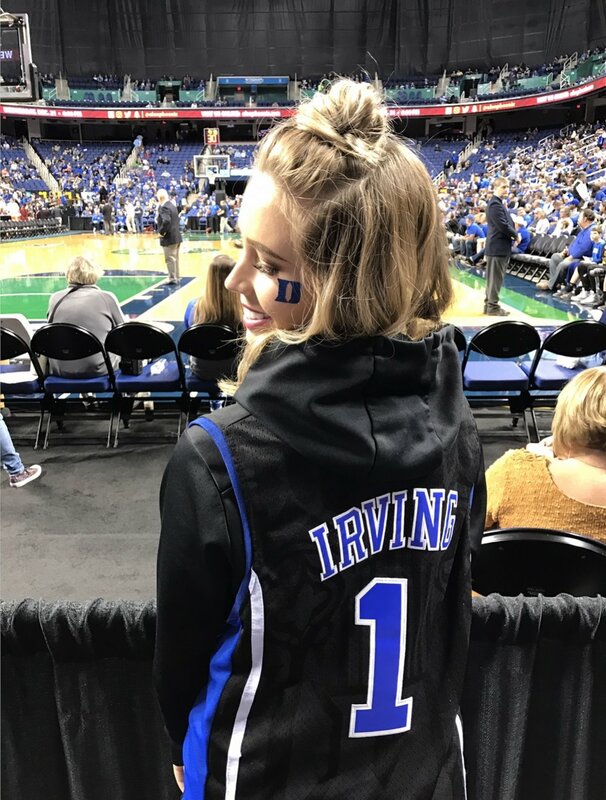 Not something Duke fans wanted to be seeing everywhere they looked, once again. Grayson is one of my favorite players and seeing him be so hated is tough, especially when I feel he has good intentions. But when he slips up, it's hard to back him up as a player (to all the trash talking fans). We all make mistakes and I am sure it is even harder to deal with when you have such a big social surrounding criticizing everything you do. Despite this incident, I think Grayson still had a good season and I enjoyed watching him play. Even though it was hard watching him get booed every time he touched the ball at an away game. I was always among the loudest in the group of Duke fans cheering him on. And it was that much better when he would hit a wide open 3 to silence the opposing fans. I am in hopes of him returning for his fourth year at Duke, so we can watch him dominate for one more year. Also return to Elon for a little redemption. No matter the outcome, or faults of any players, I'm always proud to be a Blue Devil (and Grayson) fan.